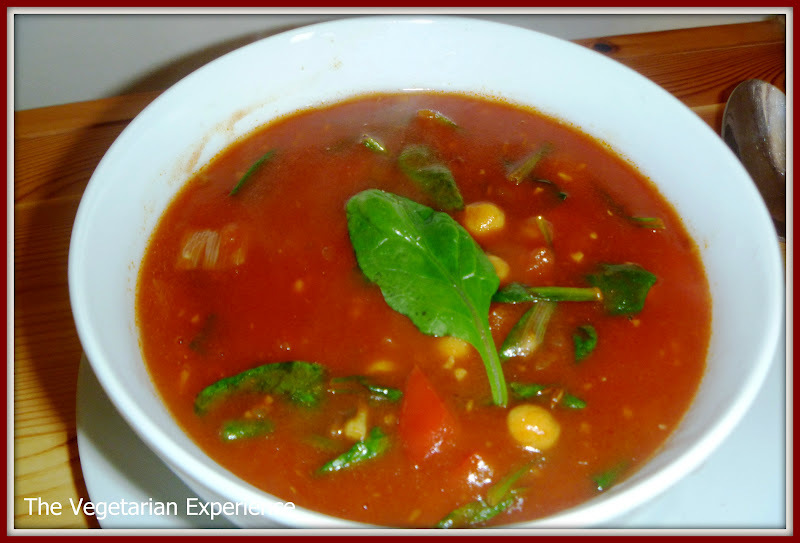 Today for the second day of National Vegetarian Week I am featuring a delicious Spinach, Chickpea and Red Pepper Soup. This soup is a great source of protein for vegetarians as it includes chickpeas. Spinach is also a great ingredient for vegetarians as it is rich in iron and calcium and contains anti-oxidants and lots of different vitamins. I really like chunky soups and so I loved eating this soup. My Spinach, Chickpea and Red Pepper Soup also looks really appetising thanks to all of the different colours in the bowl. The red pepper and the green spinach contrast very well and the chickpeas add a different colour and texture into the mix. 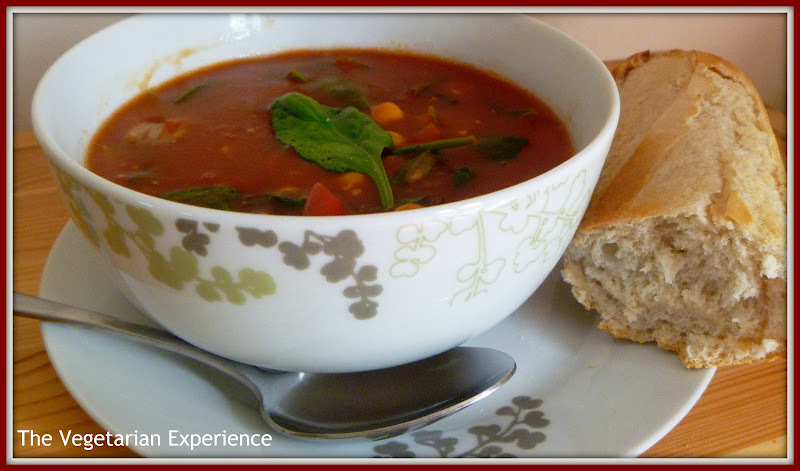 This soup is really simple to make and can be made in less than thirty minutes and was a great hit with the family. I will definitely be making this soup on a regular basis. If you decide to cook and sample this soup then do let me know what you thought! Using a large heavy-based saucepan, heat the olive oil over a medium heat. Add the spring onions to the pan, cover and cook them for two to three minutes. Next, add the pepper, garlic and cumin seeds and cook for about a minute. Add the stock and passata to the pan and bring to the boil, then reduce the heat and simmer the ingredients for about ten minutes. After this, add the chickpeas, vinegar and sugar and simmer for a further five minutes. Stir in the baby spinach and season to taste with salt and pepper. Cook until the spinach has just begun to wilt. Looks delicious, but my kids don't like lumpy soups, so I'd have to blend it! Thanks both of you, it was a really lovely soup!